Irving Berlin's "I'll See You in C-U-B-A"
We put on two exhibitions a year in our reading room, with objects primarily coming from the Library & Archives collections. Starting tomorrow (June 21), our exhibition cases will feature examples of illustrated American sheet music. The selection of sheet music in the exhibition is drawn from a gift that the Van Gorden-Williams Library and Archives received in 2004. The donors’ mother, Frances Schmidt Pemberton, collected them as a young woman working at a vaudeville theater in Rochester, New York, from about 1918 until 1925. "There'll Be a Hot Time in the U.S.A.": Illustrated American Sheet Music, 1917-1924 features sheet music published from the year that the U.S. entered WWI until five years after the end of that war. It's a rich moment in U.S. history, and the popular music of the time reflects various social phenomenon in sometimes surprising and entertaining ways. One piece of sheet music that'll be on display is Irving Berlin's 1920 song I'll See You in C-U-B-A, pictured here. While it might not be obvious from either the title or the cover illustration (I'll admit that it wasn't obvious to me), the song is one that responds directly to Prohibition. Prohibition, of course, was the result of the ratification of the 18th Amendment to the U.S. Constitution (later repealed by the 21st Amendment). Prohibition had a wide-ranging effect on life in the United States - something that was not lost on Tin Pan Alley's songwriters, whose ability to respond to current events is well-known. I'll See You in C-U-B-A is one of a few Prohibition-inspired songs that can be seen in the exhibition. If you can't make it in to the exhibition, we've got two of the songs that will be featured in the exhibition available over on our website - just go to the bottom of this page. I've included one of those songs in this post - a recording of Fred Hillebrand performing I'll See You in C-U-B-A on a 1920 Edison Blue Amberol recording. Click here for more info on the recording - and click on the play button below to give a listen. 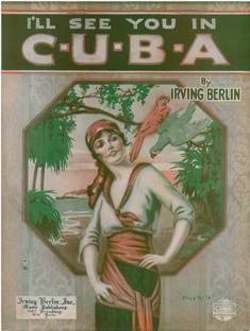 Pictured above is Irving Berlin's I'll See You in C-U-B-A [Call number: 04-111sh], published by Irving Berlin, Inc., 1920. It, along with all of the other sheet music in the show, is the gift of Estelle F. Gese, Gale S. Pemberton, and Anne D. Pemberton, in memory of Frances Schmidt Pemberton.